The 1st floor has three bedrooms which have direct access to a large balcony of 3 x 10 m. Each bedroom has two single beds, air conditioning, ceiling fan, heating, alarm clock with plafonprojectie and fitted wardrobes with safe. Bedroom 1 has a bathroom 'en suite' which is equipped with sink, toilet and shower. Bedroom 2 and 3 use the common blue bathroom which is also located on the 1st floor. This bathroom has a double sink, toilet and bath with shower. From the balcony there is seaview possible. On the ground floor is a spacious living and dining room with fireplace (satellite) television, two leather chesterfield sofas, luxury chair, dining table for 8 people, kitchen and pantry. The round hall gives access to the guest bathroom and bedroom which is locked. The lounge opens onto the naya and terrace. In the naya is a lounge set and there are also 2 Royal Garden tables with 8 chairs. The naya is illuminated with LED and is controlled by a dimmer. In addition to the naya is a covered barbecue area, which is equipped with electricity and water. The barbecue is charcoal. On the terrace by the pool 10x5m offers 8 luxury sunbeds and a hammock. The pool is lit and can be chosen from different colors. A modern computer monitors and cleans the water, leaving no chlorine needs to be used. This is perceived as very pleasant to the skin, hair and clothing. From the terrace there is seaview possible. We zijn verliefd geworden op Javea en hebben de mogelijkheid gekregen om een schitterend stuk grond van 1100m² te kopen. Samen met een architect hebben we deze villa ontworpen welke in 2007 gereed is gekomen. De schitterende ligging tegen het bos aan in een rustige moderne villa wijk, de grote beschutte tuin met privé zwembad, de korte afstand naar strand en golfbaan, de complete inrichting en niet onbelangrijk een vlakke kavel verzekeren u van een TOP vakantie. Our 10x5 pool is controlled by computer and 2 a week by our poolman. Our pool is without chlorine, nice for skin, hair and eyes. This is the 6th time we've stayed in a villa advertised by the home away group.Always felt welcome in the past and never had a single problem. Warning bells started to sound when 2 days before arrival we were advised by the owner that our cash deposit would not be returned as cash. On arrival we were met by our host a Belgian national. After handing over a large amount of cash to cover deposit, cleaning charge and linen, we were refused a receipt. She briefly asked what time we were leaving to which I responded 09:30 at the latest, then she was gone. Having traveled over 14 hours to get to the villa and it now being 21:30 we were extremely disappointed to find no dish cloths, dishwasher tabs, just even one or two welcome items. This is advertised as a luxury villa, but the bedding on every bed was the cheapest scratchy, polyester sheets and very small towels per person., some of which were stained. The owner was adamant that the host had left us a teatowel and cleaning cloths in the kitchen. Neither of which were there, some towels were left on the back door a couple days later. The owner also was very rude to us by email throughout our stay. There were no instructions anywhere in the villa. On departure we weren’t sure what to do with keys etc.. We’d told the host we needed to leave by 9:30 at the latest, but she hadn’t indicated we needed to wait for her before leaving. In the end we left @9:10, locked the drive gates, left the keys inside the villa, closed all the doors then left by the side gate which self locks. Upon arriving home I sent several emails to the owner inquiring when our deposit would be returned. Several days later and after much escalation, the response I received was that he was waiting for Electricity meter readings from the host. We’d missed the that usage over 150KWh per week would be chargeable (not displayed until checkout). Though as the owner stated this is more than adequate for a family staying in his property and the fact that were only 6,only using the aircon in the evening felt confident we’d be well within this quota. However, 4 days after returning he has stated he will deduct 20% for electricity and barbeque cleaning! Even though we were never advised the barbecue cleaning was extra (also not on listing). I have asked for proof of the meter readings but the owner refused. This is what I expected after I have told Mark that he is not welcome anymore. Always distort the truth, that's what this guy only does. Homeaway knows the real story, the complete conversation is on their website. Please read the other reviews which are exactly 180 degrees the opposite. Mijn vriendin, 2 zoons en ikzelf hebben een onvergetelijk tijd gehad in Villa Flor. De villa was voor ons een paradijs. Heerlijk om met 2 kleine kinderen niet op pad te hoeven om ultiem te kunnen genieten. De mooiste dagen hadden we gewoon thuis aan het zwembad. Wij houden van lekker eten en dat was er in overvloed, de vismarkt bij de haven en het hoge kwaliteit vlees ging elke dag weer op de BBQ in de buitenkeuken. Al met al een fantastische villa die schoon en vol luxe is en niets te wensen over laat. Wij gaan volgend jaar weer! Let me just start off by saying that this was my tenth visit to the Javea/Denia area of the Costa Blanca region and that my love for this place only gets stronger, it's great for either a romantic get away or a fun filled holiday with family and friends. Surrounded by beautiful scenery, some of the tastiest restaurants and trendiest bars......Javea is really the place to be! Villa flor itself makes a great place even better, from the moment you drive down the driveway with the remote controlled gates you know your in for a treat. The villa inside has been very tastefully decorated and is a perfect size for up to a group of eight, even when the temperature is scorching outside the villa itself stays cool and even though the villa has air conditioning in every room there wasn't much need to use them, we found the ceiling fans in every bedroom sufficient to keep us cool at night. The outdoor area is just as perfect as the villa, the chlorine free pool was a delight and a spot of night swimming was possible because of the beautiful multi coloured pool lights. The BBQ area was great too, easy to use, easy to clean and with a sink built in conveniently next to it. 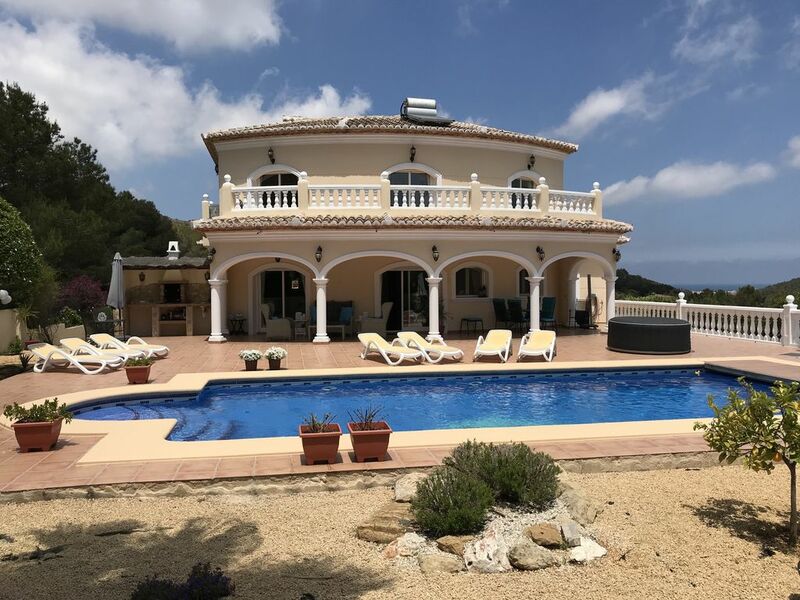 I have so much more to say about this villa but I don't want to bore you all, all in all if your looking for a luxurious villa with a perfect location then look no further. The landlord was most friendly and helpful, he even helped us with cheap transfers to and from the airport and went well beyond his duty,, thanks again Jan! Drive up to cap de la San Antonio and take some breath taking photos and enjoy the views. Spend a day beach hopping along the coast, i.e granadella, ambollo.. If young and fit then a jet ski excursion is a must, can be booked and arranged at the arenal. Explore old town, walk around the white washed narrow streets which time has seem to of left behind. Spend at least one evening dining out and bar hopping on the main promenade of Javea (arenal) or the marina area. Travel around and explore the surrounding towns and villages i.e, Denia, Jesus pombres, bennixel, ondara and many more. Spend half a day walking up the dominating mount Montgo, there's many different hikes to choose from with different levels of difficulty. If staying in this villa then a car is a must, the villa has everything you need, the kitchen is fully equipped, iron and ironing board is provided and so is the hairdryer, this really is a home from home!! Villa Flor, een aanrader !! Het klinkt zo mooi; een prachtige villa huren en met de kinderen en hun partners een weekje heerlijk relaxed samenzijn. Om heel veel redenen kan zoiets in de praktijk net even anders lopen. Is het wel vertrouwd? Zijn het foto’s van 10 jaar geleden toen het huis nog niet helemaal was uitgeleefd? Werkt alles een beetje naar behoren? Zitten we niet naast een snelweg of fabriek? Houd maar op met te bedenken wat er allemaal fout kan zijn, want Villa Flor is exact zoals je stiekem hoopte dat het zou zijn. In de eerste plaats is het zeer prettig zaken doen met de zeer attente Nederlandse eigenaar, ‘senor Flor’. Met een simpel contract, zonder vele bladzijdes met ‘indekclausules’, bevestig je gewoon wat je hebt afgesproken. Voordat je daadwerkelijk vertrekt krijg je nog een overduidelijke routebeschrijving, een opsomming van allerlei ‘POI’s’ (markten, dokters, restaurants) met hun coördinaten en de ervaringen van de eigenaar die zelf ook nog regelmatig te gast is in zijn eigen droomhuis. Dat huis, en laat je niet misleiden door een inrichting die, qua smaak, niet exact de jouwe zou kunnen zijn, overtreft alle verwachtingen. Je hebt er de luxe en ruimte van thuis (of meer). Ruimte voldoende zowel in als om het huis. Voor degene die het prettig vind, nu er de tijd is, weer eens veel werk van het eten te maken is perfect geholpen met een heerlijke keuken (6-pits fornuis, royale oven, keukenapparatuur. Amerikaanse dubbeldeurs koelkast) en een vaste BBQ. Voor wie lekker wil zonnen en af en toe en verfrissende duik wil nemen, is blij met de lekkere zonbedjes en het chloorloze zwembad. De ‘huismus’ tenslotte kan zich, als hij het buiten te warm vindt, op een van de Chesterfieldbanken vlijen en lekker even lezen, internetten (WiFi) of naar een van de ± 300 (HD-) tv-zenders kijken. Tot slot geef ik nog even aan hoe prettig het was ‘opgevangen’ te worden door een allervriendelijkste Nederlandse dame die ons het huis toonde, alle vragen kon beantwoorden en ons ook nog even de weg naar de enige op zondagmiddag geopende supermarkt wees. Villa Flor is envolved of beatiful natural environment for enjoy seeking, bicing, footing or nothing. All of us spent a lovely holidays in Villa Flor. We visited Villa Flor in August 2010 and had the most amazing time. We hired the villa with our friends and it was even better than the photographs! Our kids were delighted with the swimming pool - a real hit. Lovely and warm and safe to enter with the gentle steps. The house itself is beautifully decorated and felt just like a home from home. It was also lovely and cool midday when the kids would go in to watch a DVD and the adults had quiet time in the pool! We ate in most nights - the kitchen had everything you could need and the outside BBQ area is lovely. We went into Javea a few times which is bustling and full of life. We had a couple of lovely meals out on the seafront. The local hypermarket - Masymas - was just a 5 minute drive away from the villa and had everything you needed. It was probably the most relaxing holiday I have had and we would love to return to Villa Flor! In the neighbourhood of the beach El Arenal and the Javea Golf Club is the prestigious Urbanisation Las Laderas with 70 modern villa's. Our luxury villa has available 3 bedrooms and 2 bathrooms, is on a flat plot of 1100 m2, has a big terrace with a lounge set, 2 terrace tables and 8 chairs from Royal Garden and 8 comfort beds and a private swimming pool of 10x5m. Our swimming pool is controlled by a computer, so no chlorine is required. This is safe for eyes, skin and clothes.